Tom Stephens will become global chief technology officer for GM on Feb. 1. 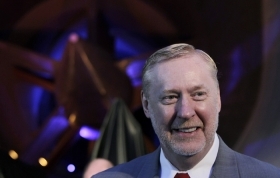 DETROIT -- Tom Stephens, the General Motors Co. executive who was tapped two years ago to replace Bob Lutz as product development chief, has been appointed to a newly created post: global chief technology officer. GM said the move will “bring greater focus and urgency to developing leading edge technology.” Stephens, 62, will oversee GM's research-and-development operation as part of the new position. The move highlights CEO Dan Akerson's goal of sharpening GM's focus on technology as a competitive advantage. Akerson, who took over as CEO Sept. 1, wants to aggressively expand the technology behind the Chevrolet Volt plug-in hybrid, for example. Today's announcement marked the third round of GM executive changes within 24 hours. On Tuesday, GM said Linda Marshall will replace the departing Chris Preuss as president of OnStar. GM also elevated Chris Perry to vice president in charge of U.S. marketing and said Rick Scheidt will succeed Perry as head of Chevrolet marketing. Stephens will remain on GM's executive committee and continue to report to Akerson. The change takes effect Feb. 1, as do the moves announced Tuesday. He has been in charge of global product development since early 2009, when he replaced Bob Lutz, who was then scheduled to retire. Lutz was widely credited with leading a product revival at GM. Honors for the Chevrolet Volt, championed by Lutz, include a North American Car of the Year award at this year's Detroit auto show. Stephens had helped continue the momentum, made evident by praise from enthusiasts and mainstream consumers for the well-done interiors and drive character of Buicks and Cadillacs, reports AutoWeek, a sister publication to Automotive News. Stephens maintained oversight of products even after Lutz subsequently unretired and took a marketing role following GM's 2009 bankruptcy. Stephens lacked the flamboyant appeal of the outspoken Lutz, who was an inspiration behind such cars as the Dodge Viper when he was at Chrysler in the 1980s and 1990s. At the time of Stephens' appointment, Gary Dilts a former Chrysler sales chief and then-senior vice president of J.D. Power and Associates, said Stephens was a great second act, but he shouldn't try to be a media star. "Lutz rallied a lot of spirit and put a lot of confidence back into the product development group," Dilts said. "Nobody is going to out-Lutz Lutz." For his part, Stephens has followed closely to Lutz's plan of continual improvement, although he put more emphasis on market research, something Lutz had been known to say gets in the way of designer instincts. Stephens previously was GM's vice president of engineering in both the powertrain division and GM's truck group. He also was an assistant engineer on Cadillac's Northstar engine. His achievements include negotiating a deal with Ford Motor Co. to share the cost of designing a family of six-speed automatic transmissions, a project that was on time and on budget. Stephens also oversaw the development of the two-mode hybrid transmission put into production on three large GM SUVs. In his new job, Stephens will work with teams across GM's geographic markets on technical innovations. His primary role “is to seek creative solutions and game-changing technologies to help GM shape the automotive future,” GM said. Lauren Abdel-Razzaq contributed to this report.